Sydney’s been a student of mine for about 8 years now, since she was 12. Sydney is absolutely delightful. Everyone at the dojo adores her. 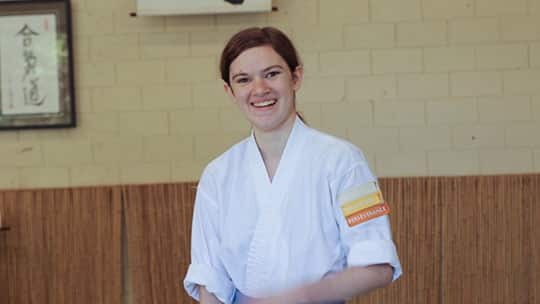 On the mat, Sydney has tons of fun and her aikido is extremely effective. She’s as fast as greased lightening. Here’s Sydney’s story about when someone came at her with a knife. That was a mistake! A lot of people say that aikido is not martially effective. I’m reminded of something Hiroshi Ikeda Shihan says about that. Ikeda Shihan says that the question is not whether aikido is effective. 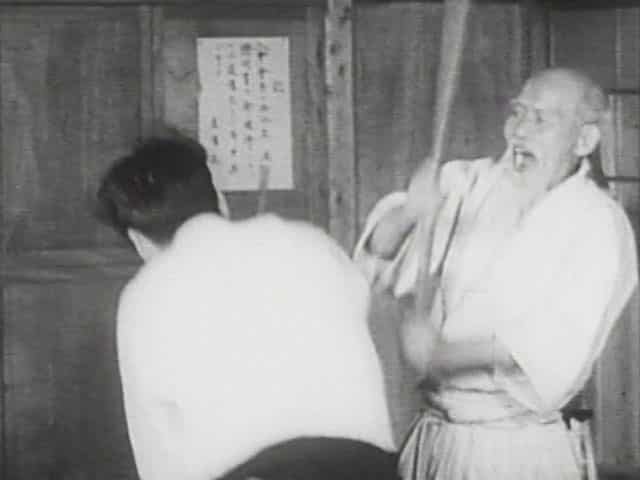 The question is whether *your* aikido is effective. Ikeda Shihan’s is and Sydney’s is, at least it was on that night. That’s what matters. Practice for your art to be effective and it will be. Practice otherwise and you’ll get something else. At Aikido’Ka, we practice martially effective aikido in a safe, fun, friendly atmosphere. And I’m so, so happy that Sydney is safe. In 2011, Stan Pranin wrote an article about having an experience on a train that he resolved with a kiai. For those of you who don’t know, a “kiai” is the martial shout that we’ve all seen in movies and TV shows. Briefly, Stan was on a train in Tokyo, Japan in the 1980s. At the other end of the train, two men started fighting. Before long, one man was clearly dominating the other. The other man was getting pretty seriously beaten and bloodied. The aggressor grabbed the other fellow by the hair and collar and began banging his head against the vertical, metal column. Obviously, this was getting really bad. No one was doing anything about it. Without thought, Stan jumped up and ran to the other end of the car. Neither man saw him coming. Stan stopped a few feet away from the men and gave the loudest kiai shout he could. The aggressor looked at him in shock and backed away. Stan then carefully took the other man away and into another train car. By this time the train had come into a station and stopped. Stan took the fellow off the train. The man said he was OK and left. I have several kiai stories, absolutely none as exciting as Stan’s. The each go something like this: I am walking on the sidewalk. As I approach the corner, a pedestrian ahead of me is starting to cross the street. A car pulls up to the corner and the driver is looking to make the turn. The driver doesn’t see the pedestrian. The pedestrian continues to cross the street oblivious to being seconds from being run over. Noticing this, I shout very loudly “No,” or “Stop”, or even just a kiai. The response is pretty much always the same. Everyone on the street stops. People walking on the other side of the street stop. If people are driving slowly they stop. The pedestrian stops, looks around, and sees that he or she was about to be run over, and then looks at me. The driver who is about to turn stops, looks around and realizes that he/she was about to run someone over and then looks at me. I just smile and shrug and keep walking. Promptly everyone goes back to their business with no one getting run over. I’ve shouted several “saving” kiais several times and they’ve worked every time. When I started training in martial arts, I never had any idea that kiais could be for other peoples’ benefit. Have you had this sort of thing happen?